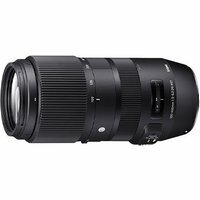 Sigmas 100-400m f5-6.3 DG OS HSM is a powerful and versatile lens that offers an impressive performance in a package that is surprisingly compact. Featuring both telephoto and macro functionality, as well as a push/pull zoom mechanism, this lens offers a range of features expected from higher cost lenses. This lens fits on cameras with a Sigma mount.